The Teacher Education Accreditation Council (TEAC) has named the Teacher Education Program at Michigan Tech as a 2013 finalist for the Frank B. Murray Award for Excellence and Innovation in Program Self-Study. TEAC is dedicated to helping educator preparation programs improve and be accountable for their quality. The award recognizes a program’s evidence of quality that makes it worthy of accreditation. The teacher education program at Michigan Tech is nationally accredited by TEAC and has received a rating of “exemplary” from the Michigan Department of Education. Our program’s graduates meet all state mandates for teacher licensure as defined by the Professional Standards for Michigan Teachers. TheTeacher Ed program has been accredited by TEAC through 2019. Teachers from schools throughout the Great Lakes watershed are spending this week in Green Bay, Wis., learning about ship building and shipping on the Great Lakes. 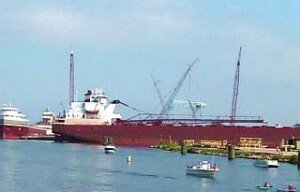 The four-day teacher institute is sponsored by Michigan Tech, the University of Wisconsin-Madison, North Coast Marine Manufacturing Alliance and Northeast Wisconsin Technical College, with funding from the National Center for Freight and Infrastructure Research and Education. Read more at Tech Today, by Jennifer Donovan. Assistant Professor, Myounghoon “Philart” Jeon (CLS) and his colleagues presented three projects at the 15th International Conference on Human-Computer Interaction (HCII2013), Las Vegas, Nevada, July 21-26, 2013. Jeon, M., Winton, R. J., Henry, G. A., Oh, S., Bruce, C. M., and Walker, B. N. “Designing interactive sonification for live aquarium exhibits.” This third paper has won the Best Poster Award among 303 posters. HCI International Conference accommodates more than 3,500 participants from all around the world. Michigan Tech has launched a new virtual tour of campus and the local area. The Harold Meese Center is included among the virtual walking tours. 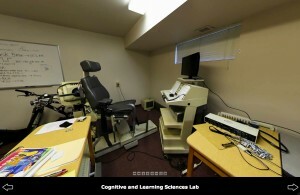 There are interactive panoramas of Cognitive and Learning Sciences Labs as well. Assistant Professor Myounghoon “Philart” Jeon (CLS) presented a paper, “Science or art? 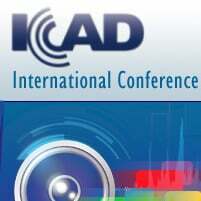 Sonification in the age of biocybernetic reproduction: A case study of the accessible aquarium project,” at the 19th International Conference on Auditory Display (ICAD 2013) in Poland, July 6-10. 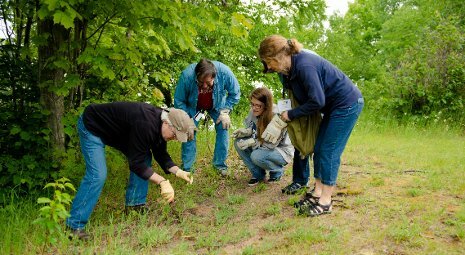 Nine middle and high school teachers from Michigan and Illinois are back in class themselves at Michigan Tech this week, learning about global changes–including climate change–and ways to bring the issues to life in their classrooms. 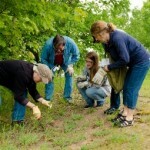 The global change institute is one of three Summer Teacher Institutes that the University is offering this year. 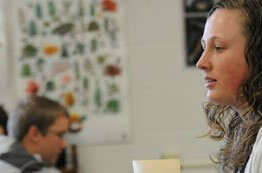 Participating teachers will receive two graduate credits from Michigan Tech. “They’re basically looking for climate change experience to help them with curriculum development,” said Evan Kane, assistant professor at the School of Forest Resource and Environmental Science. Wednesday afternoon, the group toured the PEATcosm Experiment at the U.S. Forest Service Laboratory in Houghton. Using peat samples harvested from Minnesota, researchers are testing 24 mesocosms – four bins each of three different plant compositions and two water table levels. 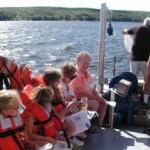 The public is invited to see first-hand how scientists assess the health of Lake Superior, during free half-hour rides on Michigan Tech’s research vessel Agassiz this Saturday afternoon during the Copper Country Strawberry Festival in Chassell. “Copper Country residents and visitors are encouraged to learn how scientists study the Great Lakes and what factors contribute to a healthy lake,” said Joan Chadde, education program director of the Western UP Center for Science, Mathematics and Environmental Education, a sponsor of the event along with the GLRC. The 2013 Copper Country Strawberry Festival will be held Friday and Saturday, July 12 and 13, in Chassell. The event is also known as the Chassell Strawberry Festival. Many of today’s events, such as the quilt show, wagon rides, and arts and crafts, continue into Saturday. They’re joined by other events, including the parade at 11 a.m., the Friends of Fashion show, a chicken barbecue, a pancake breakfast, children’s games and 45-minute voyages aboard the Agassiz research vessel. During each ride, a Great Lakes scientist will demonstrate the use of sampling equipment to collect plankton, sediment and other water quality information that provide data about the health of the lake, or in this case, Chassell Bay. 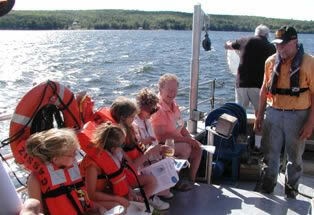 Microscopes aboard will enable participants to view the organisms collected.